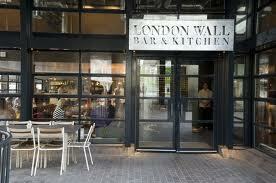 London Wall Bar & Kitchen is a welcoming, family -friendly restaurant, located right next to the Museum of London. Woodfired pizzas made using homemade dough is our speciality, but the menu also features family favourites like burgers, salads and grills. The relaxing lounge and wide range of draft beers combine to create the ideal spot for some evening drinks, with delicious bar snacks never far away. We are open for coffee and cakes in the afternoon, making London Wall Bar & Kitchen the perfect place to rest weary feet after exploring the nearby museum. You can also enjoy your meal knowing that we will contribute a portion of your bill to the Museum of London to support its work. Its a great place for a private party!! Not to used in conjunction with any other offers. Opening hours: 9am-11pm Monday – Friday (food served 12-3pm and 5-9:45pm).